Enjoy the flavours and variety of Espresso in an instant with these rich, luxurious flavours. Strong. Intense. Full-Bodied. Go bold with this Italian-style espresso for those who know what they want and aren’t afraid to demand it. Tre blends robust flavour with a side of adventure in each drop, you may even want more than one cup per sitting. Organo™ Espresso provides 3 different blends of espresso coffee to give you the robust flavour that you love – without an expensive espresso machine or a trip to the coffee house! Use as a base for home based coffee house drinks, or drink on its own for an intensely flavoured pick me up. 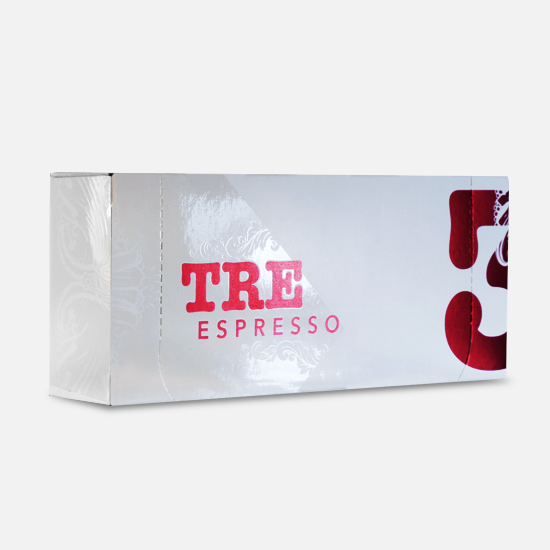 Tre – a blend of both Robusta and Arabica – this intensely flavoured espresso is Italian rich in style and taste. Bold and complex, a true espresso lovers coffee. Arabica coffee –Arabica coffee is the finest, richest coffee in the world. The unroasted beans smell a bit like blueberry, and once roasted they yield a floral/fruit floral scent that speaks to its soft flavour. Grown at higher altitudes than other coffee beans, in cool, subtropical climates. Robusta coffee – less common than Arabica, this coffee is produced at lower altitudes than Arabica, yielding a less sweet and bolder flavour. 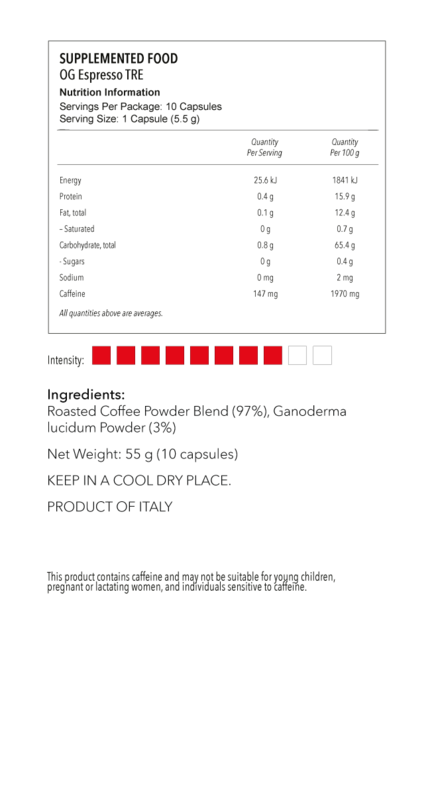 It is often used most in Italian espresso, giving it that dark, rich, complex flavour. The name ‘espresso’ means ‘forced out”, as espresso machines force hot water through finely ground coffee beans. It was invented as a way to serve coffee quickly, and gained popularity due to its intense flavour and aroma. The first espresso machines began to be used in the late 1800’s. The ‘for you’ and ‘fast’ nature of creating coffee is what caused the espresso machine to be built, using hot water forced through coffee beans under pressure. The central contribution of high-pressure espresso, however, was crema — an infinitely complex foam of emulsified oils and volatile compounds that has become the standard for quality. The capsules are compatible with Nespresso®* coffee machines for home use. Can also be used to make your own ‘coffee house’ cappuccinos, lattes, and Americanos. * The trademark is not the property of Organo Gold or any related company.